I can't believe we are already well into summer! I haven't gone to the beach yet here but I know when I do it's always a struggle on what I should pack for after the beach activities. So when my gorgeous friend Tanya over at Leopard Lace & Cheesecake invited me to do a Beach to Boardwalk Babe collab with her, of course I said yes! We all have a pretty good idea of what to pack for a day at the beach, but what do we pack if we want go get some food or a drink afterwards and can't go home for a nice shower first?? Here are some things I'd pack for a day at the beach. For a bag I usually use a freebie that I received as a gift with purchase from a makeup counter like Lancome or Estee Lauder. I have so many of these pretty bags and they are perfect for the beach! You have to pack sunscreen, and I prefer the spray kind for my body and a higher SPF for my face, and of course an SPF lip balm. I always pack some conditioner and a hairbrush for when I get out of the water. When my hair gets wet, I put a small amount of conditioner and it makes it MUCH easier to brush through. Also not shown of course is a hat, sunglasses, and magazine. I personally don't ever bother with makeup to the beach. A pair of sunglasses and a fun hat is all I need to hide my non-made up face! For fun after the beach I'd pack another small baggie to beautify a bit. I forgot to show that I'd pack some cleansing towelettes for my face. For my hair I'd pack some beach spray and some hair serum/oil. Since my hair would already be manageable from the conditioner in my beach bag, I'd just run some oil through it to prevent frizz as much as possible. Then if I felt like it I'd add some of the beach wave spray. As a face moisturizer I'd just use the sunscreen that I already packed. I didn't want to bother with makeup brushes so I packed things that I can apply with my fingers. 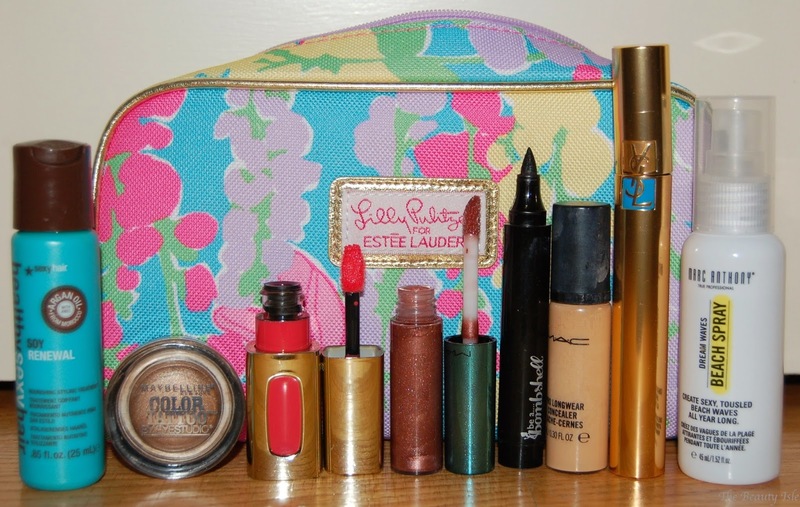 Packing a small bottle/tube of concealer will be prefect to cover my dark spots and under eyes. I'd pack some waterproof eyeliner and mascara and a Maybelline Color Tattoo eye shadow (in Bad to the Bronze) because this can also be applied with your fingers. I wouldn't pack lipstick because that would most certainly melt in the hot car. Gloss-like products are perfect for a time like this and since the rest of your look is pretty natural, you can go for a nice bright color. I'd like to thank Tanya for inviting me to do this collaboration, it was fun to think about and put together! Be sure to check out the other girls joining in this collab too. I know I'll be checking out their ideas for what to pack on my next beach to boardwalk day out! 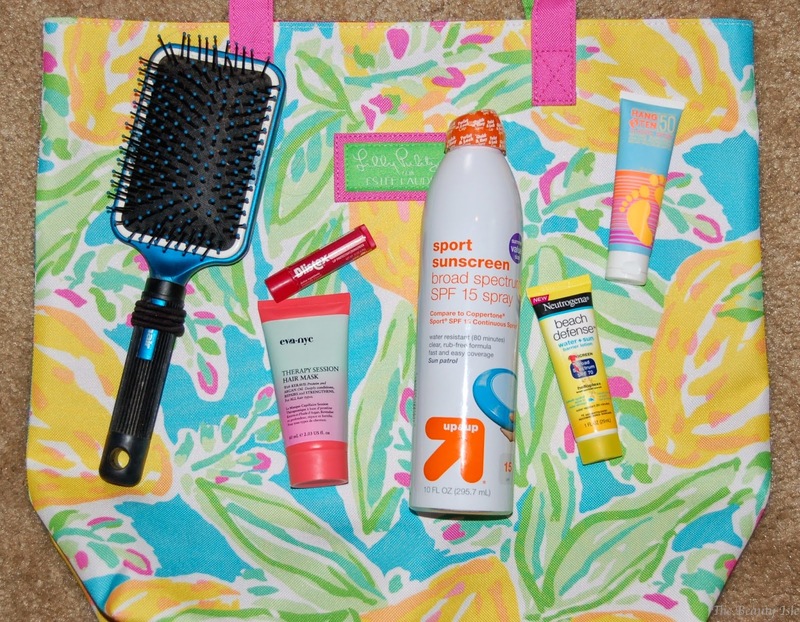 What do you pack for the beach? What about if you plan to go out after? ?